Home Comfort Components that set Bryant® apart the rest! 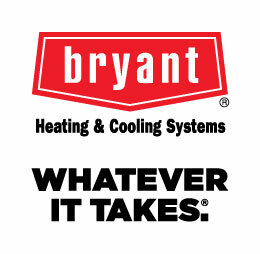 Experience the Whatever It Takes® difference, with over 100 years of experience Bryant® builds with your comfort in mind! Their exclusive Evolution® V air conditioner has cutting edge design and technology for whole-home comfort. Heating and air conditioner systems are not a one size fits all solution. You need our experienced tech team at Sanders & Johnson to find you the best Bryant® solution for your specific family needs. Bryant® EVOLUTION® Model 180B delivers up to 21.0 SEER cooling efficiency. Remember the higher the SEER (Seasonal energy Efficiency Ratio) the less electricity is used to cool. Since 1996 Bryant® has used Puron® refrigerant well before the competition began offering a solution to protect the Earth’s ozone layer. Model 189B operated with the Bryant® inverter-driven variable -speed scroll compressor to provide a quiet operation. Complete electronic control board that works with the Evolution® Connex™ Control inside the home for an ultimate command of your indoor comfort zones. High efficiency models make small adjustments to deliver comfort with precision that standard and two-stage models do not deliver. Cutting edge inverter-controlled precision provides humidity control as it senses the incremental changes in your home. Bryant® Connex™ Control gives you control over temperature, humidity, ventilation and more with just the touch of a screen or wireless access. This ultra-quiet product means the operation is as low as 56 dB on lower comfort stages. Our two-stage operations: low to reduces energy consumption and high to maintain a comfort level perfect for your conditions. Our proprietary Perfect Humidity® technology features multi-speed systems to maximize humidity removal without over cooling. Multi-stage operation match current conditions and automatically adjust to your comfort level providing consistent temperatures, reduced hot/cold spots and total humidity management. AeroQuiet System II™ reduces sound and optimizes airflow and minimizes vibration. Find peace of mind with Bryant® Evolution® System air conditioners knowing that they have been quality tested and Bryant® and Sanders & Johnson are committed to providing you with lasting quality and service.